After the murders of two Bajiquan masters, the ungoverned Kowloon Walled City falls into complete disarray and chaos. Years later, a son of one of the masters, Chor Au Kuen, returns to look for his long lost sister. But after seeing how the area is now entirely controlled by ruthless triads, he forms an alliance with the son of the other master, Duen Ying Fung, to get rid of them. Meanwhile, a mysterious group of assassins enter the city with ulterior motives and a connection to both of them and their fathers’ deaths. Keeping in line with my watch-anything-Ruco-is-in philosophy, I had been really looking forward to watching A Fist Within Four Walls. Despite it being yet another drama starring Nancy Wu and a bunch of inexperienced actors, all the signs pointed to this being a “win” for TVB. Luckily for us, the viewers, TVB’s investment in this drama paid off because A Fist Within Four Walls is one of the best TVB dramas of 2016. And yes, while standards for what constitutes as a good TVB drama is admittedly very low nowadays, A Fist Within Four Walls does enough to hold viewer’s interests throughout with lovable characters, plot twists and relatively high production value. The best part about A Fist Within Four Walls is, without a doubt, its action scenes. Too often dramas take the easy way out with action sequences with poor choreography and stunt performers looking nothing like their actor counterparts. A Fist Within Four Walls must have realized that simply wasn’t going to work with a drama that is almost completely driven by martial arts. 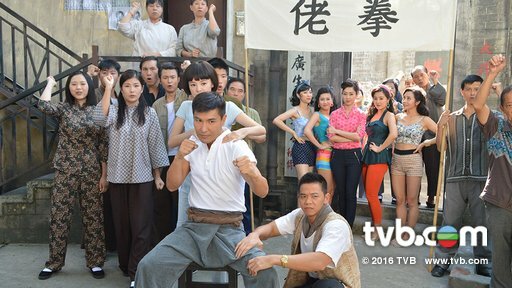 By having actual martial artists like Yuen Qiu and Philip Ng in the cast, the slapstick quality that plagues this type of dramas was taken out and legitimacy was added. Each of the action sequences (and there were A LOT) seemed realistic and detailed. No flying wires to be seen around here, ha. My only criticism regarding the action would be the overuse of slow motion, which was kind of a blatant rip-off of Wong Kar-wai’s The Grandmaster. Not a dealbreaker though. Less successful than the numerous action scenes was the actual plot of A Fist Within Four Walls. While I was certainly entertained by the endless plot twists and reveals, the story overall just seemed a little too unbelievable. For a drama that is set in a very distinct time and place in Hong Kong’s history, it would seem the logical thing to do is write a plot that is similarly grounded in reality. But alas, A Fist Within Four Walls‘ plot fell into the TVB trap of nonsensical endings that drag on for episodes. More than anything, I felt that every issue or question that would be presented to the characters would be quickly and conveniently resolved. If something didn’t have a neat solution, the writers would simply put in a convenient excuse to explain it away. (When in doubt, just blame it on the assassins!) That, or they’d just randomly kill off characters. The laziness showed, especially in the ending. I never have high expectations for the acting in TVB dramas anymore, especially not ones that are full of new, inexperienced actors. Unfortunately, that applies to A Fist Within Four Walls too. Ruco Chan and Nancy Wu obviously held their own as the most veteran TVB actors here, although I didn’t think either of their performances were all that amazing. Ruco, in particular, had a much better showing in last year’s Eye in the Sky. But after losing out on the TV King award last year, all signs are pointing to him bringing it home this time around with this drama. Ruco and Nancy’s characters were likable in their lighthearted banter, but may have overplayed the “star-crossed lovers” thing a bit. Also, am I the only one suffering from major Nancy Wu fatigue? I understand why she’s in so many TVB dramas, but my god, so many. 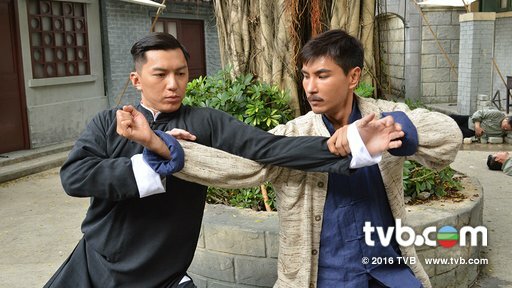 The drama probably suffered the most from the acting of Benjamin Yuen and Philip Ng. Benjamin’s acting as the other male lead wasn’t exactly atrocious, but his attempts to play the demeanor of his character as cool and stoic just came across as stiff and unnatural. I know it’s slim pickings over at TVB nowadays, but he’s just not ready to be a lead. On the other hand, Philip Ng simply resorted to screaming his lines to express his character’s bullheadedness. Too many times I literally cringed watching him act. Even acting opposite a veteran actress like Yuen Qiu didn’t help. This brings me to my next complaint: why was Yuen Qiu so underutilized?! They basically cast her as a side character. C’mon, TVB. 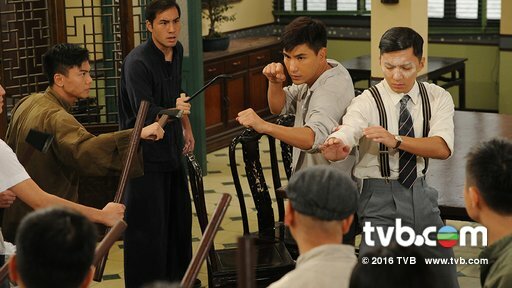 The reality of the situation is that A Fist Within Four Walls is about as good as it’s going to get from TVB. My standards are so low for their dramas now that I can easily overlook bad acting and some nonsensical plotlines as long as it’s cohesive with a mostly capable and charming cast. This drama had that AND some kickass fight scenes, so hooray! Certainly far from perfect, but in this new era of TVB dramas, an entertaining drama with a unique setting like A Fist Within Four Walls is all we can ask and hope for. A Fist Within Four Walls is directed and produced by Jazz Boon, who was also responsible for the popular 2014 TVB drama, Line Walker. The theme song, “Seige,” is performed by Ruco Chan. The sub-theme song, “Never Knew You Were the Best,” is performed by Ruco Chan and Nancy Wu. A Fist Within Four Walls is the highest-rated/most watched Hong Kong drama of 2016, averaging 30.7 points per episode. Yuen Qiu is a well-known martial artist and was taught by the same master as Jackie Chan and Sammo Hung. After a 20 year absence from the entertainment industry, she returned to star in Stephen Chow’s popular film, Kung Fu Hustle. Philip Ng, action choreographer and martial arts star, agreed to star in his first TVB drama after three months of negotiation. A Fist Within Four Walls was developed after his casting. Prior to this drama, you may have known of Philip Ng as Linda Chung’s ex-boyfriend. Nancy Wu and Grace Wong recently starred together in the 2016 TVB drama, Short End of the Stick. Benjamin Yuen was the winner of the 2007 Mr. Hong Kong beauty pageant. Moon Lau was the second runner-up in the 2013 Miss Hong Kong beauty pageant. The winner and first runner-up from that year are current TVB actresses, Grace Chan and Sisley Choi, respectively.